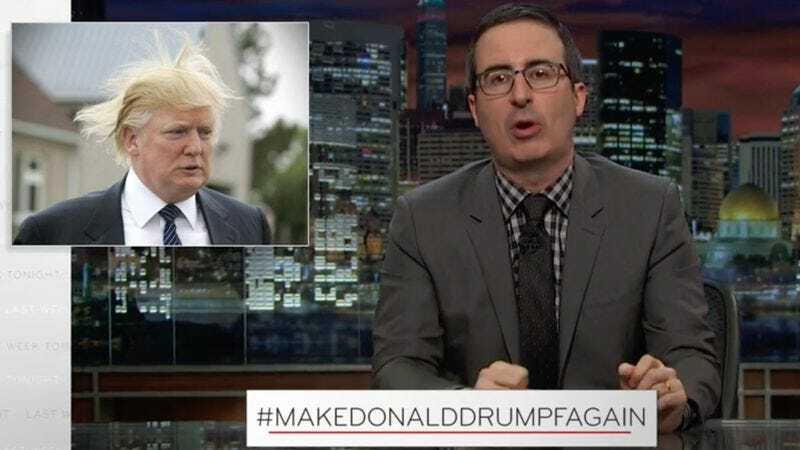 Though he’s previously declined to dignify Donald Trump’s presidential campaign with a response, it seems John Oliver can no longer ignore the orange elephant in the room, especially not when it’s accompanied by the Grand Old Party. So the Last Week Tonight host waxed vitriolic on the Republican frontrunner for nearly 22 minutes on Sunday’s episode, first describing Trump as the possibly cancerous “back mole” that America should probably get checked out (if not excised) at this point. Oliver acknowledged the entertainment value in Trump’s shenanigans as well as his appeal for voters weary of the party establishment, who have been won over by the tycoon’s brashness and aura of success. But as Oliver recounted some of Trump’s history, the candidate’s feats began to sound more like mythology. The host cited PolitiFact’s survey of Trump’s truthiness, as well as his faulty short-term memory regarding his own provocative tweets, including one in which he accused Jon Stewart of not being “proud of his heritage” because the former Daily Show host had changed his last name from Leibowitz (never mind that “Stuart” is his middle name).